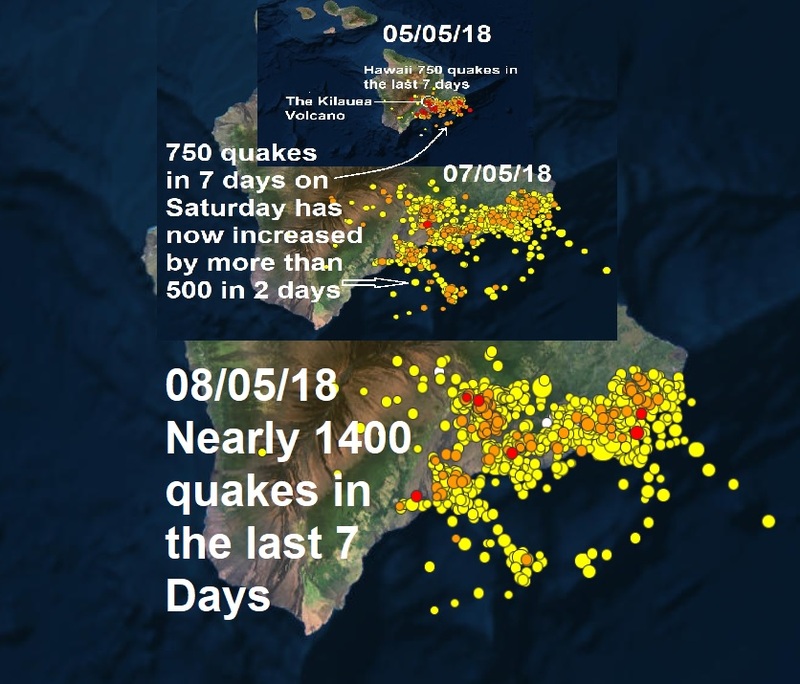 Nearly another 150 quakes rattled the South Island of Hawaii yesterday bringing the total to more than 1360 quakes of various power in the last 7 days as the island continues to be shaken and it doesn't look like stopping anytime soon! Lava and gas continued to erupt from Kilauea volcano across a remote, rural neighbourhood on Hawaii Island, and by Monday had destroyed 35 structures, including at least 26 homes, authorities said. By Monday, the emission of lava from multiple fissures had become minimal, the U.S. Geological Survey Hawaiian Volcano Observatory said, but "this is likely only a pause in activity; additional outbreaks or a resumption of activity are anticipated as seismicity continues in the area." Lava flows had advanced slowly northward throughout Sunday in the Leilani Gardens neighbourhood, in large part fueled by a fissure that had been spewing lava fountains to heights of more than 200 feet, the U.S. Geological Survey said. A lava flow from that crack moved about 0.6 miles to the northeast before it stopped. Video published by the USGS showed asphalt roads being slowly consumed by a moving wall of molten rock, with thick red-hot lava glowing underneath, as black smoke billowed upward. USGS helicopter footage showed a river of ash cut through the lush tropical forest, with a lava fountain that had been active Sunday billowing red-hot molten rock around the charred landscape. At least 10 fissures have developed since Kilauea began a fresh eruption Thursday in the Leilani Estates neighbourhood, located about 25 miles east of the summit of Kilauea, one of the world's most active volcanoes and Hawaii Island's youngest. Ground cracks have begun to emerge crossing Highway 130, west of the eruptions, the USGS said. Fluctuating and intermittent eruptions are likely to continue along the volcano's eastern shoulder, known as the lower East Rift Zone, and scientists warned that although Leilani Estates remains at highest risk, other areas in the region could also fall at risk if the eruption continues. There was no way to say for certain how long the current eruption would continue. In 2014, lava spilt out from the volcano and authorities worried for months that the town of Pahoa would be inundated.